Just what the X-Men needed: more angry jerks. A master of solar energy, Sunfire converts solar radiation into powerful plasma outputs, perfect for scorching his enemies. The sliding scale of time in comics means that many characters' origins sometimes need to be tweaked and updated - The Punisher won't be able to be a Vietnam vet for very much longer, unless Marvel wants him to trade in his battle van for a motorized wheelchair, you know? But the more minor the character, the less attention is paid to them. For instance, Sunfire's origin is that his mother was a survivor of Hiroshima, and that his powers didn't activate until his rabidly anti-American uncle took him to the city and had him touch the radioactive soil. Neither of things makes a lick of sense for a character who's active today. But also, no one ever thinks about Sunfire, so no one cares. Since Sunfire is often described as an "atomic samurai," you'd think his costume would reflect that - you know, a mask that resembles a samurai helmet, something along those lines. Instead, he wears... this thing, which makes him look like a carp. Notice: that's "like a carp," not "like crap." It's a really weird design, either way. Bonus points for avoiding the stereotype though, I guess, but that doesn't make it not weird. The figure uses the same body as Spider-Man 2099, with the extra hinge joints in the pecs. It's surprising they didn't use the "armored" limbs Hobgoblin and Green Goblin had, since his costume is often shown to be similarly scaly. Maybe they would have felt scrawny on this torso? But then, there's nothing about this torso that says it had to be used for Sunfire, other than the fact that it's something new and means he doesn't have to look like he rolled off the clone assembly line. Shiro Yashida has really only worn three different costumes: the original, the '90s techno abomination, and the "Age of Apocalypse" thing (we're ignoring his Big Hero 6 costume, because almost no one read that book, and he didn't make it into the movie). There have been several versions of his classic costume, mostly going back and forth over whether the white stripes on his torso went straight up and down, or angled in toward the center. This figure goes for the latter, which is a better design - it calls to mind the Rising Sun flag. 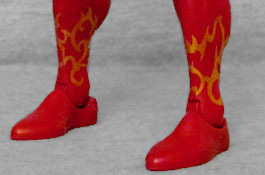 Unfortunately, Hasbro has chosen gold for the flame patterns on his forearms, shins and forehead, rather than a more comicbooky yellow, which makes them easy to overlook under normal lighting. His accessories are a pair of flame bursts that fit over his hands to show his powers. They look better here than they did when they got reused for Johnny Storm. The pieces are more translucent here than they were there, with yellow at the base and red at the tips. They fit nicely onto the fists, and won't fall off too easily while you're flying him around. The figure also includes a piece of this series' Build-A-Figure, Warlock. Sunfire gets the entire torso, which is kind of an important part if you want to build the whole thing. 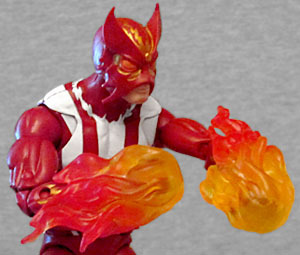 Sunfire is more of a loner than a team player, but he's also a classic X-Men character who doesn't get a lot of action figures. The gold paint on this one would be better as yellow, but otherwise he's a nice offering.